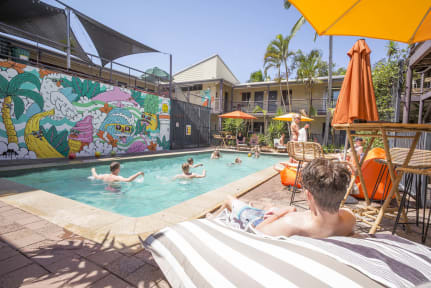 Loved the Byron Bay YHA. Modern, with a great vibe and clean (though our floor wasn’t hoovered for a while and was like a mini beach!). Great location and all the facilities you need, including Woolworths 2 minutes away. Only downside... 1 hairdryer that was kept booked out (though the YHA isn’t responsible for selfish behaviour). Staff are lovely and helpful. Had a great stay at this hostel. Really close to the tourist info centre where the skybus or other airport shuttles pick up and drop off. Front desk staff were very helpful. There’s activities you can book with the hostel and surf boards/bikes for hire. Would definitely stay again! Very clean hostel with a great atmosphere and comfy beds. They have lots of activites and cheap food options available! Can't say anything bad about this place. Clean, secure facilities, friendly staff and well priced accomodation. Overall I think this is a good hostel and in a good location. It was clean and spacious with a great kitchen. It has a lovely pool and chill out area. Beds are super comfy too. The main reason I didn’t give it a 10/10 was because it isn’t very social. There are no evening activities, no bar or social events so I met nobody during my time here. I actually went to other hostel bars to meet people. A lot of families and older groups of people which on the plus side meant it was quiet and relaxed.